We have observed the way that you have all been sustaining a higher vibration in spite of the fact that what you see around you seems to indicate that most of humanity is regressing. If you follow the news, it would appear from the major stories that are put out there, that humanity is not doing very well at all. And in response to the current state of being on planet Earth, we see all of you working harder. We see all of you praying more, intending more, and creating more for the human collective. You don’t just look for ways to make your lives better, but instead, you want what is best for everyone. You are using your powers to create a better version of life on planet Earth for all beings. 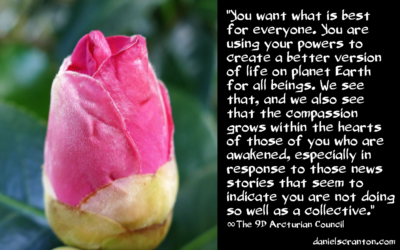 We see that, and we also see that the compassion grows within the hearts of those of you who are awakened, especially in response to those news stories that seem to indicate you are not doing so well as a collective. What you need to understand is that you are going to see the darkness in the world continue because it is necessary to give individuals the opportunity to feel what they need to feel, to process what they need to process, and to release what they need to release. And if you are getting triggered by what you are seeing, then you know there is more work for you to do as well. But as you keep your hearts open and your hopes high, you are the ones who are holding space for this human collective. And you are the ones who are capable of receiving the downloads and upgrades that are coming. You will help the unawakened get to where they need to go. You will help to ready them for the shift in consciousness. You are already doing so. This we can see, and this we can verify for you.